Once the colorization is complete, you will be able to extract every color in a separate Animation Layer. You can do separately it for every color, all of the colors of the same Layer, or extract only a particular color. 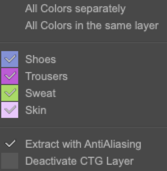 You then can deactivate the CTG Layer and work on your color's Animation Layers to apply FXs to them for example. 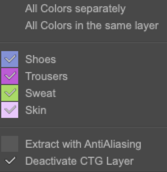 If you have correctly named the colors with the Edit Colors options, you will find the list of names here, which can be very handy to extract one specific color. Here the 4 colors have been extracted separately. Here only the Skin color has been extracted. You can also check the last option, Extract with Antialiasing if you wish. Here, the 4 colors have been extracted with antialiasing.